Many parents are interested in BPA-Free soothers and baby bottles while tests of BPA (Bisphenol A) have been gaining attention. The uncertainty is great. However, MAM provides reassurance: Today, MAM soothers, bottles, teethers etc. are made only with BPA-Free materials. MAM has decided years ago to continuously remove BPA from production and switch to safe material alternatives. As a replacement, MAM uses BPA-Free polypropylene (PP). This material is undisputed, approved worldwide and completely safe. 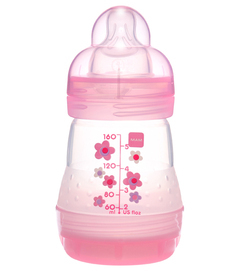 Also, the materials used to produce the MAM bottle and soother teats (latex/silicone) are BPA-Free. Thanks to the unique teamwork between medical research, technology and innovative design, MAM has been able to build an advantage and use BPA-Free materials. A new test confirms: MAM Soothers are BPA-Free. BPA (Bisphenol A) is a material used in the manufacture of polycarbonate plastic (PC). Food packaging, plastic utensils and some baby articles such as soother shields and bottles are some examples of products made from PC. Some experts and studies note a risk in the migration of BPA. "Migration" means that traces of BPA leach out of the plastic into the food and is absorbed by the body, possibly causing disruptions to the endocrine system, as well as putting stress on the circulatory system and metabolism. Other renowned institutions such as the European Food Safety Authority and its American counterpart, the U.S. FDA, classify BPA in low doses as safe. Did you know that soothers save babies lives? Soothers perform an important safety function. The use of an appropriate soother is in fact, as evidenced by numerous international studies, one of the most effective defences against SIDS (Sudden Infant Death Syndrome). Find more information about SIDS here. With MAM BPA-Free soothers, parents can use this vital protective function with confidence. The Anti-Colic is just one of the innovative developments from the MAM design studio. Its vented base works according to a unique natural-flow principle which ensures a smooth flow of milk. It is available in two sizes and unique designs.